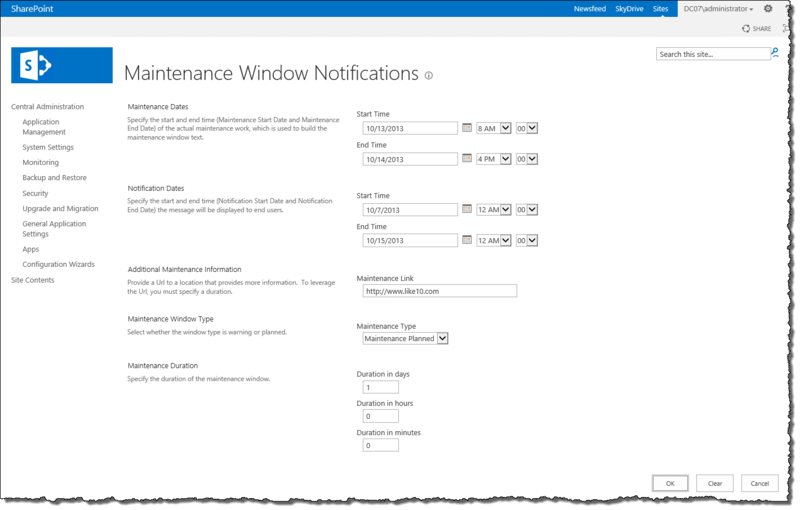 In case you missed it, SharePoint 2013 introduced a new class named SPMaintenanceWindow. This class makes it super easy to notify your users of upcoming maintenance to your SharePoint Farm at the Content Database level. I read a blog post by Joe Rodgers a Microsoft SharePoint PFE who demonstrated what can be done with this class using PowerShell. If you have access to your production environments to run PowerShell great, of course this is not always the case. I have found over the past few years that getting direct access to production and staging environments is becoming less and less likely. Basically the class allows you to specify information which is presented in a banner for the sites whose Content Databases maintenance windows have been set. Joe outlines all of the different possibilities in his blog post so I won’t repeat that here. Multiple Day Maintenance Warning with a duration and more information link specified. Wouldn’t it be nice if I could do this from Central Administration instead of PowerShell. This is pretty sweet and all I needed was an admin page in Central Administration. These is very easy to do with Visual Studio 2013 RC, Microsoft has a short walkthrough to get you started deploying a page under the _admin virtual directory (it is for 2010 but still applies). The current version sets the same Maintenance Window for all of the Content Databases and allows you to clear the Maintenance Window also. The next version of it I want to add functionality to set a Maintenance Window for a specific Content Database or the Content Databases in a Web Application. Now THAT would be very handy!